Britain’s Got Talent has become a cornerstone of car crash television in recent times. In a show which is supposed to ‘showcase’ all our nation’s talent, it simply shows that we don’t have any whatsoever (this is usually highlighted in the cringe-worthy audition stages). Despite all this, the beleaguered brand is still pulling in a few million viewers every Saturday night and now we are at the semi-final stages of the competition you’d expect to see some sort of actual talent. Ben Blaque was one of those contestants hoping to prove that he had what it takes. Ben really loves his arrows, so much so in fact that he asked judge Alesha Dixon to shoot some at him while he was strapped to a board. Whatever floats your boat. However, when Alesha pulled the leaver, two arrows rocketed out toward Ben instead of one, shocking the audience. It’s fair to say he looked pretty relieved to have not been hurt after the malfunction, but even more nervous that something else could go wrong during the routine. I think the fact that it went wrong made it better. I personally would not trust Alesha to pull the handle and fire an arrow at me. But in a strange way, by Alesha being an idiot and accidentally releasing two arrows, it made the act better. Despite nearly being impaled by one of the judges his death-defying act still wasn’t enough to get him through to the next round. Well there’s always next year I guess (and the year after that and the year after that). 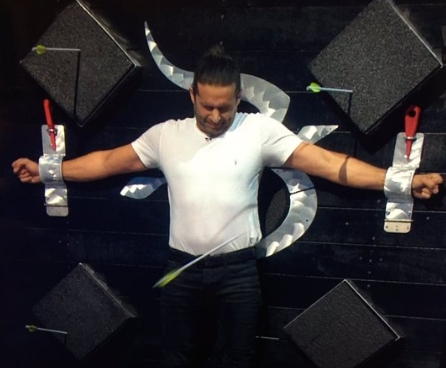 Watch the horrifying moment Alesha Dixon fired TWO razor-sharp arrows at terrified magician in BGT – but did anything actually go wrong or was it all just a stunt?